Starter Strings is our beginning string ensemble. In this class, students from grades 3 and up are introduced to the string instrument of their choice (violin, viola, cello, or string bass). 45-minute group lessons are held at several sites throughout the Springfield area, including elementary schools and churches. Musicians use the method book Sound Innovations for Strings: Book I to assist with learning the fundamental skills needed to play a string instrument. 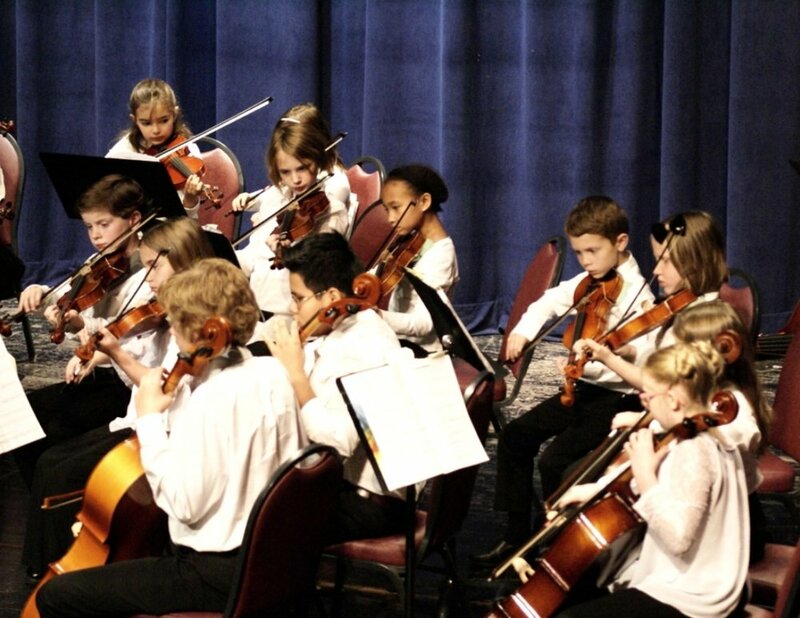 Starter Strings classes meet before school, after school, and in the evening. Check the rehearsal schedule for specific locations, days, and times. Auditions are not required to join Starter Strings. Tuition is $225 for approximately 30 weeks of 45-minute group lessons. Junior Strings is a string orchestra for musicians learning and perfecting the skills presented in Sound Innovations for Strings: Book 1. Musicians will remain in Junior Strings until they have completed and mastered the entire Book 1. This typically takes an additional one to two years after completing Starter Strings. Musicians will also begin to develop ensemble skills by learning and performing quality string orchestra literature that meets their ability level. Junior Strings meets at 6:00-7:00pm at Our Savior's Lutheran Church or 4:30-5:30pm on Wednesday nights in Hoogland Center for the Arts. Auditions are required for students who have not completed Starter Strings. Tuition is $250 for approximately 30 weeks of 1 hour orchestra rehearsals. Preparatory Orchestra is a string orchestra for musicians who have completed and mastered skills presented in Sound Innovations for Strings: Book 1. Musicians will continue to learn new technical skills while working through a level two method book. They will develop ensemble skills by learning and performing quality string orchestra literature that meets their ability level. Musicians typically remain in Preparatory Orchestra for two to four years. Preparatory Orchestra meets at 6:00-7:00pm on Wednesday nights in the Hoogland Center for the Arts. Auditions are required for admittance into Preparatory Orchestra. Tuition is $250 for approximately 30 weeks of 1 hour orchestra rehearsals. Sinfonia Orchestra is the string orchestra for musicians who have mastered all of the skills presented in Sound Innovations for String Orchestra: Book 2 or Essential Elements for Strings: Book 2. Musicians prepared for Sinfonia Orchestra generally take private lessons on their orchestra instrument. They will continue to learn new technical skills while working through a level 3 method book. They will continue developing ensemble skills by learning and performing high quality string orchestra literature that meets their ability level. Musicians typically remain in Sinfonia Orchestra for two to four years. Sinfonia Orchestra meets from 7:00-8:30pm on Wednesday nights in the Hoogland Center for the Arts. Auditions are required for admittance into Sinfonia Orchestra. Tuition is $300 for approximately 30 weeks of 1.5 hour orchestra rehearsals. Youth Symphony is a full orchestra comprised of strings, woodwinds, brass, and percussion. Members will perform a diverse cross-section of pieces from the orchestral repertoire as they develop as musicians and orchestral players. Youth Symphony meets from 5:15-7:15pm on Tuesday nights in the Hoogland Center for the Arts. Auditions are required for admittance into Youth Symphony. Tuition is $350 for approximately 30 weeks of 2 hour orchestra rehearsals. Sangamon Valley Civic Orchestra is a full orchestra for adult community members of Springfield and the surrounding communities. The orchestra plays a wide variety of literature in three concerts per season. Civic Orchestra meets from 7:30-9:30pm on Tuesday nights in the Hoogland Center for the Arts. Membership to the ensemble is through audition with the Music Director. Interested musicians must be adults.